"I have booked my holiday rental and planned my days out, but I want a cook to shop and prepare my meals"
Let yourself be pampered by a fresh buffet breakfast, a mid morning snack or a lovingly prepared picnic lunch for your days out, then a 4-course dinner prepared fresh with local ingredients. All I need from you are your food requirements, and I do the rest. 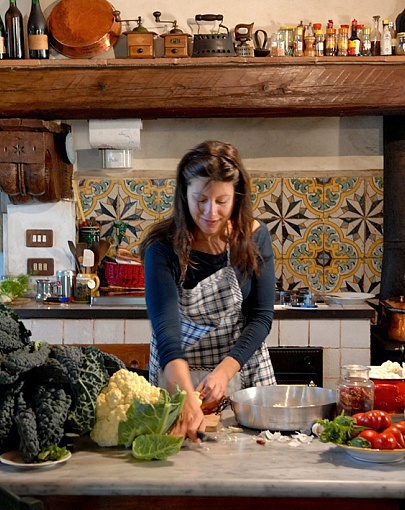 If you're spending your holidays in Siena, Tuscany and its region, or even just passing through, do not miss the Cooking Class with our selected chefs! It will be an authentic cooking class where you learn the secrets of traditional dishes prepared, in this case with excellent local products, freshly laid eggs, home-grown herbs and vegetables (in season of course), cheese and olive oil produced by our neighbors. You will learn to make pasta dishes that you can easily prepare later in your own country with products you can easily find abroad, surprising your friends and family! Preparation of at least two first courses: pasta dishes (tagliatelle or ravioli) or gnocchi (potato dumplings) made by the students in the traditional way without the use of machinery of any kind, accompanied by their sauces. Preparation of one main dish and a dessert. Lunch/dinner to celebrate your Italian dishes included in the price! from 76 to 90 Euro per person.